And just why could this possibly be the hardest saying in the Bible? Simple! Because it’s so easy to let good things slip away! For example, if a Believer decides to adopt the regimen of setting aside three special times a day for prayer, it’s so easy to eventually let these special times slip away. Maybe some crisis occurs, or some lifestyle interruption, or just too many cares and pleasures pile up, causing the Believer to fall off this schedule of thrice-daily prayer-time. Quite often, the Believer will be tempted into a certain bad habit or nagging sin. And he or she decides to compromise by allowing some seemingly lesser substitute instead. Maybe that Believer tries to overcome the temptation to drink by only allowing himself to drink “Near-Beer”. Or a former cigarette addict decides to overcome the temptation to go back to smoking, by substituting with e-cigarettes. Or he decides to once again to go back to watching “just a little television”. In each case, such tempted ones will eventually fall back into the real thing! The “Near-Beer” drinker will most likely find himself back to drinking the real thing. And the e-cigarette smoker, in a moment of weakness, will light up a real cigarette. And the television watcher will find himself watching more and more programs. Yes, God sees right through our hearts. He knows that we may still be secretly, even unconsciously harboring lust for this or that pleasurable sin. And so, in His mercy, He will sometimes allow the Devil to sift us as wheat, just as he did to Peter on the night he denied His Lord. And God may just decide to allow our sins to fester out like Job’s sore boils, causing us to completely fall back into our old sins. And so, we must decide to never allow our selves to capitulate with temptation! But here is where it becomes really difficult! Because, just when we make vows, the Devil often will come along, and patiently draw us back into that old besetting sin, so that all those noble resolutions become like worthless ropes of sand! So what’s the answer? How can we overcome our “Old Man” who desires to gain control of our life and soul? This above prescription for spiritual victory is not just for a night, or a week, but is for a lifetime. Yes, until we fully overcome the world, the flesh, and the Devil, we must take on this type of repentance and seeking after God’s mercy and grace. And so, this seeming paradox of being sorrowful, yet always rejoicing will be ours, just as Paul rejoiced in the midst of his trials, if indeed, we allow God’s chastening Hand to continue to do its work in our hearts. And once this promise is fulfilled for us, we will never ever compromise with sin again; but we will instead hold fast to, and walk continually by every single “great and precious promise” which the Bible declares! 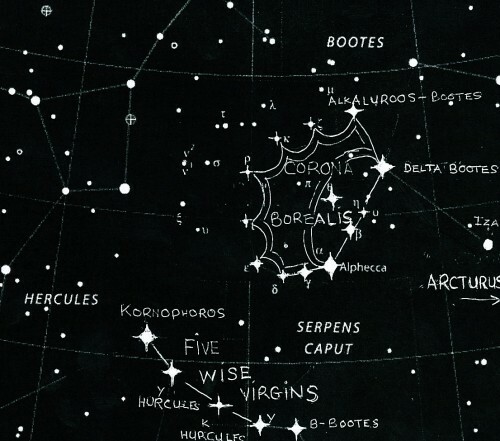 ABOVE STAR-CHART – Summer constellation – Five Wise Virgins Stars & The Glorious Crown – Corona Borealis – signsofheaven.org – Not for profit uses! – Wikipedia Star chart with constellations drawn in by this website.